It may seem strange that the first story in La cabeza del coerdero, Francisco Ayala’s collection of short stories about the Spanish civil war, has, at first sight, nothing to do with the war itself. It concerns, rather, an encounter between two cousins, one of whom tells the other of a strange manuscript whose writing cannot be deciphered. Anticlimactically, however, the mystery is left unresolved as the two men part before they can even locate the piece of paper in question. The “message” that gives the story its title is oblique at best. We may end up wondering if it even exists, or if it is not merely an invention of fervent imagination and small-town gossip in what is depicted as a backwater in which little of real import ever happens. But “El mensaje” sets the tone for what follows, not least in making clear that ten years on (the book’s first edition came out, in Argentina, in 1949), it was still hard to imagine approaching the conflict directly or unequivocally. Indeed, only one of the subsequent tales (“El Tajo”) is set during the war itself, and even here we are a long way from the main event, on a quiet front on which there is no actual fighting. The story’s protagonist, a Lieutenant Santolalla, describes his experience of the war in terms of “an empty, useless period of waiting, that at first brought to the mouth the delicious taste of holidays in the distant past and that later, even its darkest hours, he had learned to endure [. . .] as one of life’s many inconveniences, like some kind of temporary illness, a flu about which you could do nothing but wait until it went away of its own accord” (116). Ayala is not telling us that this is what the war was like–though it’s worth being reminded that every war has its lulls and its longueurs. But it is about as close as he can take us to the violence itself. For all of a sudden, pretty much out of nowhere, comes a brief moment of senseless destruction that will haunt Santolalla for years to come. So a second theme that we now see that “El mensaje” has introduced is the notion of unpredictability: throughout the stories, characters are constantly surprised, constantly made aware that their best guesses of what is around the corner are profoundly misguided. In the title story, “La cabeza del cordero,” for instance, a traveller has no sooner installed himself in his hotel in Fez, Morocco, than he finds that his arrival is apparently expected by remote relatives of whose very existence he had been utterly unaware. Or in “El regreso,” a man returning to Spain after a period of exile in Argentina comes up with a series of hypotheses about the fate of his former best friend and his family, only to be taken aback by the one eventuality that he had failed to consider. In each case, moreover, these surprises don’t bear further examination: the cousin in “El mensaje” takes the first bus out of town; the traveller in Fez resolves to move on as quickly as possible to Marrakesh; and the returning exile in “El regreso” turns his back and “on the way made the decision–that I would delay carrying out no more than was unavoidable–of returning to Buenos Aires” (184). Initial curiosity, in other words, turns very soon to revulsion or denial. 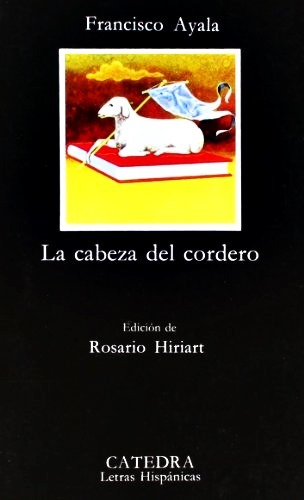 La cabeza del cordero, in other words, takes on the responsibility of representing the war, but soon finds it absurd, inscrutable, impossible, too traumatic for anything but the gibberish that the character in the final story, “La vida por la opinión,” produces over a long period of hiding. Given the disillusion, disappointment, and distress, better perhaps “Not to think about anything.” “As if,” Ayala immediately reminds us–and perhaps himself–“it were possible not to think about anything” (245).